Well, this is a rarity! I am actually able to sit down at my PC tonight and write to my blog! Sorry it's taken me so bloody long but life has definitely gotten in the way lately! Although, it also transpires that I might be able to repeat the phenomena that is blogging tomorrow night also! But we shall wait for that, shan't we, no promises, I'm pretty rubbish at this web logging lark! I was hugely excited about visiting this pub as I have ridden past it on my bike or the bus for the past 12 years! I'd lived down the road in Chelsea for about 10 years and have also worked in Victoria for the past 5 years but have never once been to this place despite always thinking how nice it looked. So, my friend Jenny and I were meeting up for a bite to eat (we used to be drinking buddies in my 20's, now we're dinner, drink and a chat buddies... am I getting old?!). Anyway, along to the restaurant I happily trotted (actually I took the bus, quite lazy actually as it's less than a mile's walk from where I work!) armed with my Taste London Card and with that the knowledge our meals would be 2 for 1 - hurrah! Although the company was ace - and I've been convinced to borrow one of Joe's squash racquets and bash a few balls at the Queen Mother Sports Centre when my ankle gets better (more about that in another post)... unfortunately the food wasn't up to expectations, which is such a shame! 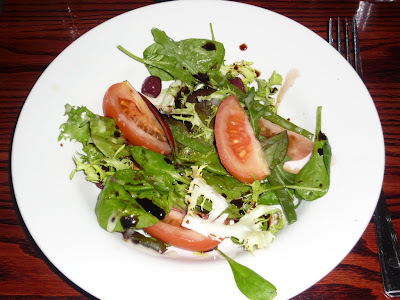 The starter was reasonable but not memorable, in fact, so much so that I've forgotten what I ordered (didn't photograph it). I've studied the menu but I just can't put my finger on it - I'm sure it was some sort of salad, and it would have either been the goats cheese or the smoked chicken, but I couldn't swear on it! 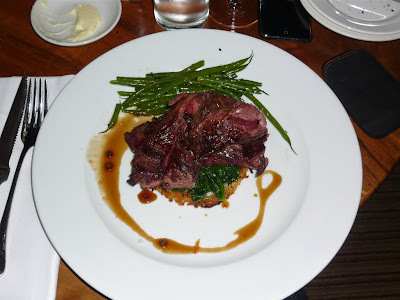 I really fancied a nice bit of beef so I ordered the Grilled bavette steak (with rosti potato, spinach and peppercorn jus) for my main and asked for it to be served rare. Unfortunately, although it looked rather nice, it both smelled and tasted like a raw slab of meat and was really chewy to boot! The green beans were quite oily and the rosti potato was massively salty - although not as bad as our experience last month when we went with a couple of friends to Mela in Shaftesbury Avenue, the food was very tasty but we could tell it was rather salty... so drank plenty of water and I wasn't even drinking alcohol... however, by the time we got out the tube station we were gasping for water and downed a litre between us of the stuff as soon as we were able to buy it! Ahh well, we only paid for half of the food and now at least I can say that I've finally been there!! A couple of days later I met up some friends for dinner in Soho. My lovely friend Lorna organised a big group of us girlies to go and eat, which is pretty impressive, I think there were about 18 of us - I wouldn't have had the patience!! Maxwells is one of those places where you know you're going to get good sized portions of tasty non-fussy food. It's usually one featured by companies like Lastminute.com in their 'Dinner and Theatre' packages. As there were so many of us we had to choose from the the party menu where we got a starter, main of our choice and a cocktail for a really decent price, can't remember exactly but I don't think it was even £25! For my main course I chose the 'herbed chicken and mash' (Herb marinated breast of chicken with garlic mashed potatoes, steamed broccoli florets and creamy wild mushroom sauce) and I have to say it was really rather good! However, some of our party ordered it and I had to endure *serious* steak envy throughout the whole of my main course - ha!! I grew up in Maida Vale, ahh, lovely place to live actually though could never afford to now! As house prices were so much lower when she took out the mortgage all those years ago she's paid it off now and owns it outright - which is awesome as properties round there, regardless of size, are worth a bomb! I do wish they'd sell it and get a bigger place, or at least somewhere with a garden now my stepdad has retired, I reckon he deserves one!! Anyway, so it's always odd to return to my old stomping ground but nice anyway, lovely area and with big old beautiful imposing buildings towering over you at every turn - very impressive! 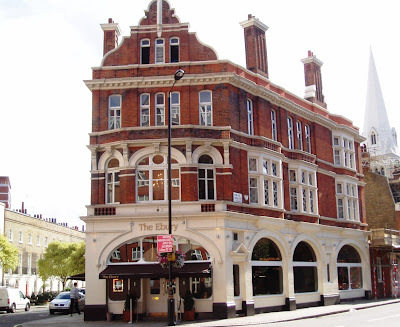 Maida Vale is home to a Café Rouge which is my Mum's second home I think haha (apart from the Dojo that is!). They do steak, they do it well. There's nothing else that needs to be said really ha! Seriously though the food is always good, although lacking in variation - but then if you know what you like and you know they do it well then why stray from the beaten path?! 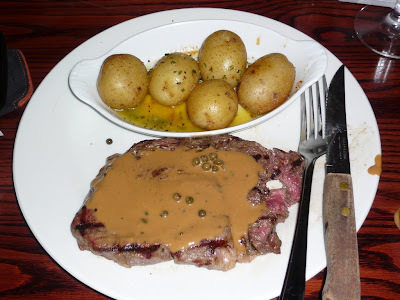 I had my steak rare, and it was perfect, my Mum had hers blue! We ended up actually meeting with the guy and his son in an attempt to try and salvage something as he obviously still wants to sell the property but he realises that other places sell for a lot more. However, that's because they've had the work put in to raise them up to a certain standard, this place needs sooooo much work!! Anyway, it's back on again now, with more money involved, so hopefully it'll be smoother sailing from this point on but I'm not pinning my hopes down again like last time! They've always had fab offers but now they're on Taste London too!! I get 50% off ALL food with my card, result! What I especially like about GBK is the fact that if you order a burger without the bun (which you might do if you're odd like me), instead of just giving you a burger without the bun... you also get a load of yummy extras added to your plate to fill the space like salad and coleslaw! I ordered the Buffalo Burger, seriously, it's delish! 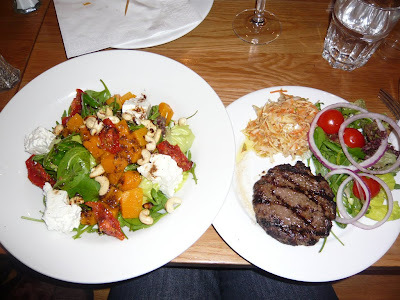 They say it's "Exclusive to GBK from the world famous organic Laverstoke Park Farm"
As I wasn't having chips like the boys I opted for a Butternut Squash Salad which was "feta, oven roasted tomatoes, cashew nuts, mixed leaves & ginger dressing". Although I knew it would be a relatively decent size I wasn't prepared for how huge it was! arghh, I've been typing for nearly 2 hours now, ridiculous!